I searched for this, but couldn't find it. I just learned how to use the code logger to find graphics, so I figured I'd add this. If it does already exist somewhere, then disregard. This isn't comprehensive, as there may be a way to give more tiles for the NFC logo. 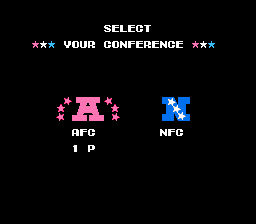 Currently, the AFC logo can have up to 48 tiles, while the NFC gets only 16. I doubt there's enough free tiles to use that many, however. The pro bowl conference logos (what you see when you pick the pro bowl option from the main menu) start at x169a0. The first byte is for the palette and the next 16 place tiles. x00 will give all black (background). The tiles are arranged in columns of four tiles before moving to the next row (up to four rows); then it moves to the next section of four columns and four rows, etc. The NFC logo starts at x169d3. Again, the first byte is for the palette and the next 16 place the tiles. The default AFC palette is x55, which gives gray, dark red, and light red. The default NFC palette is xAA, which gives gray, white, and blue. Using x00 for a palette gives blue, red, and white. I don't have a good understanding of what number provides what palette and found x00 by random chance. CB, CE-CF, D0-DF, E0-E1, E4-E5, E7, F0-F7. E6 and E8 appear to be blank, so they could maybe be used, but I don't know if they're used elsewhere in the game. Also, to get the AFC logo aligned like the NFC logo (if you're only using 16 tiles each), start at x169b1 to choose your palette. Then, x169b2 will be 00. Every 4th byte from there will be x00 as well. The rest will place your tiles. At x169c2, you'll set your palette again. x169c3 and every 4th byte will be other tiles and the rest will be x00. Don't forget to x00 out the bytes starting at x169a1. Just to be clear we're talking about this screen and these logos, right? Correct. Sorry to dig up an old thread. I got busy with life and stopped tinkering with ROMs for a while. I'm casually getting back into it for now, but forgot most of what I learned two years ago. I just hate to leave a question unanswered.